If you’ve played guitar before, a long time ago, you might be discouraged to think of what your experience will be picking up the instrument again right now. Maybe it’s a little bit like a closet in the attic that you don’t dare open, for fear of what may fall out. Since we react more strongly to negative emotions than to positive ones, the hurt of losing something far outweighs the hurt of never having gained it, and even the joy of having won it in the first place. If you used to be able to play guitar before, it probably hurts to think that you can’t anymore. Nobody wants to go backwards. The good news is that you never really forget anything, and picking up the guitar again is one of the best decisions you could make. Skills that we gain during our lives have the power to permanently change the structure of the brain. When you return to a skill that you haven’t worked on in awhile, the initial feeling of rustiness can be overpowering and discouraging. Although that rustiness is very real, it is far less significant an obstacle than the incompetence of a total beginner. If you power through it, you can come out on the other side better than you ever were before. When you fail to remember how to play a song you used to know ages ago, you have to confront the pain of loss. But what you’re not seeing is how quickly you can now re-learn it, especially compared to someone who never knew it in the first place. It’s all up there somewhere, however deeply buried. You just need to remember how to retrieve it! Memory cannot easily be measured with a pass/fail test. 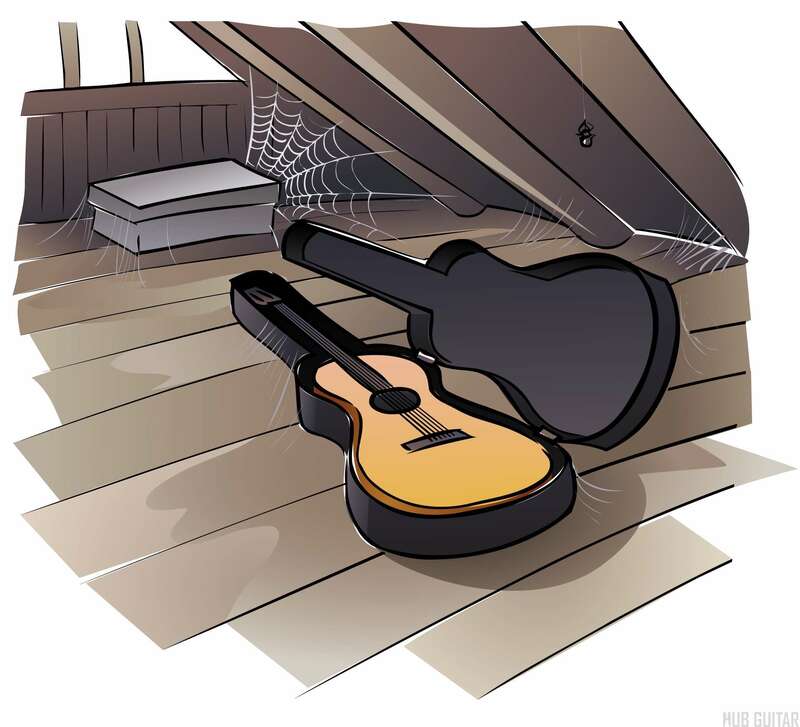 Although you might not remember how to play at this moment, beginning down the path to learning the guitar will help you access a great deal of content stored deep in your memory—perhaps you can eventually retrieve everything you once knew. And as you go further down the rabbit hole, you may be surprised to find that certain challenges now feel easier. In your time away, you have learned new ways of thinking and new methods for solving problems. As you reignite the passion that once led you to pick up the guitar, you might find that the tenacity of the enthusiastic “beginner” is now able to solve many problems that felt out of reach during your time as a jaded and experienced player. In other words, combining the advantage of all of the things you learned in the distant past with the enthusiasm of having a "fresh start" might just be the formula for bringing you to a new level—one you had never reached before. If you’re going to return to studying the guitar after a long absence, you should consider examining your thoughts for negative patterns that will limit you today. Things that you once taught yourself to be true may never have been true at all—and now’s the time to let these thoughts go. These thoughts are all examples of fixed-state thinking that restricts you from achieving your true potential. You need to remember that your favorite player was once a beginner, too, and that with only a tiny handful of exceptions, the vast majority of high achievers in this world get there through persistence and hard work rather than through some innate gift bestowed unto them at birth. Perhaps it is your erroneous belief in these imagined limits that caused you to fall off of the path in the first place. Will playing the guitar with fluency and dexterity give you joy? Confidence? Hope? Will it raise your self-esteem? Will it make you feel good? Is it a gift you might one day share with your partner, your children—or even grandchildren? Will you find relaxation and relief in just strumming a few chords? What can playing the guitar do for you? Do you remember? Spend some time thinking about how much you'd like to be able to play again. Do you want this? How much? Thinking about all of the benefits you came up with, and how valuable this practice will be to you, decide how much you want it. Could it be that this is something you’ve always quietly wanted in your inner mind, and you’ve allowed other things to drown it out? Could this be a need that has been waiting to be fulfilled? Do you owe this to yourself? If you need to buy an instrument, buy it. Is anybody really unable to get their hands on a decent instrument nowadays? If you need to take some lessons, go do it. Will 30 minutes per week and about as many dollars really set you back significantly? And how much time do you need to practice? Is 30 minutes of your day really a huge loss, when compared to the enormous gain you may get from it? If this dream of yours is still there somewhere, bring it to life. Take the leap that will propel you to rediscovering the joy of playing the guitar. Sign up for a guitar lesson. Set aside an hour (or more!) out of your long and lengthy weekend day. Pick up that guitar and see what you can remember within an hour. Getting back on this wagon might be the best thing you ever did for yourself.